Online line car rental ( G S Holiday) provides you 13 Seater Deluxe Tempo Traveler for a group of 13 persons or less. There have 2 separate seats for driver and helper. Body makers of Tempo Traveler are Force Motors and Bajaj Motors. 13 Seater AC Bus Tempo Traveler On Hire Rent From Mumbai. Destination Location: All over Maharashtra,Gujarat,Goa,Karnataka. Our reputed entity is engaged in supplying 13 Seater Tempo Traveller Rental. We have Luxury Push back 12 to 26 Seater Tempo Tavelers for Wedding, picnics, Site Seeing, Tours and marriage purpose. Our company has been successful in winning appreciation from the clients as one of the most prominent names in supply of 13 Seater Tempo Traveller Rental. We are engaged in offering 13 Seater Tempo Traveller Rental. We are a top notch supplier of 14 Seater Tempo Traveller Rental in Amritsar Call 9517006009 Tempo Traveller Hire for Outstation Tours to North India, Tempo Traveller Rental from Amritsar to Dalhousie Dharamshala Manali Shimla Tours, Tempo Traveller Cab is best option for Group Tours. Tempo Traveller on Rent in Ahmedabad. 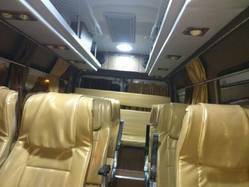 Hire 9seat, 10seat, 11seat, 12seat, 13seat, 14seat, 15seat, 16seat, 17seat, 18seat, 19seat, 20seat, 21seat, 22seat Tempo Traveller in Ahmedabad, Gujarat. Hire in Local tour or outstation tour.